Yes!!! I’ve hit my personal goal! It’s been a journey and I just wanted to say a big thank you to Gail Nicholls and Vaughan Taylor aka Gail Nicholls Fitness for your support over the last 2 years. I have lost a total of 4 stone and really couldn’t have achieved this without you! The best thing is all of the friends that I’ve made at Bootcamp. It’s so much more than just a Bootcamp! The support, friendships and motivation is truly something else! I’ve had a tough time which caused my weight gain initially. So you really will never know how much your support and Bootcamp means to me, and the journey I’ve I’ve gone through to get to this point today. 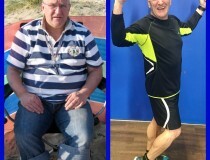 Gail and Vaughan you have both enabled me to achieve this goal with your support, Bootcamp and amazing classes. 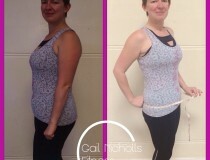 I first started Bootcamp 2 years ago with my friend Hayley who introduced me to the class. It was an experience! I was at my lowest point and the heaviest I’d ever been. I was self conscious and scared. However, I arrived and straight away felt at ease. There were lots of people of all shapes and sizes and I didn’t feel like I stood out. I immediately felt that there was a friendly atmosphere and everyone chatted and spoke. The first Bootcamp was tough and I actually cried my eyes out when I got home, but you know what, I did it! It killed me but I did it! So I just kept on turning up, and look where I am now! 4 stone lighter and feeling amazing both physically and mentally. I also enjoy going to Boxerbeat and Insanity classes, which I love! But now it’s all about maintaining! Well that’s easy! I’ll just keep on turning up to Bootcamp. It’s just part of my ‘life routine’!